Corn and coconut oils are important vegetable oils containing many valuable compounds necessary for life. These oils are known to have nutritional and valuable healthy qualities/properties, attributed mainly to fatty acid composition, tocols, carotenoids, polyphenols, etc. The antioxidant properties confer many health benefits, such as reducing the risk of cardiovascular disease, cancer, and other diseases. Fatty acids and related metabolite derivatives from coconut and corn oils are known to have excellent antimicrobial properties as well. 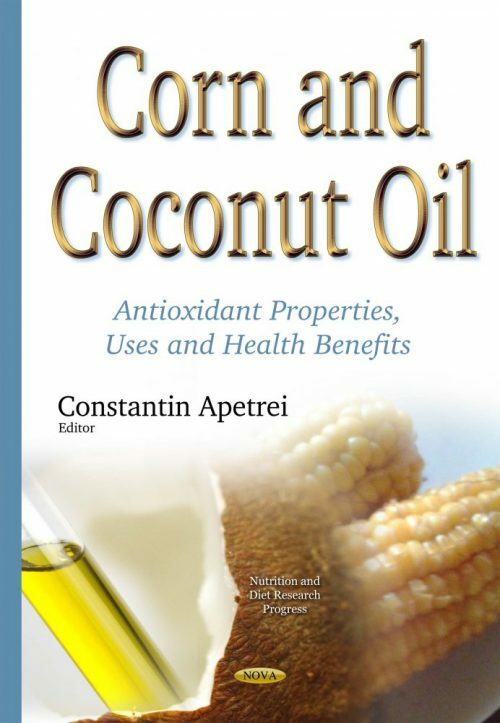 This book comprises different multi- and interdisciplinary approaches related to the production, chemical composition, quality and authentication, uses, antimicrobial properties, and health benefits of corn and coconut oils, described by important authors from all over the world. This book will be helpful for a wide range of readers, from university students to researchers. The book is written for students (license, master or pHD), researchers, and teachers. It is inter- and multidisciplinary. The book is useful in Universities, research centers, and organizations releted to food benefices.